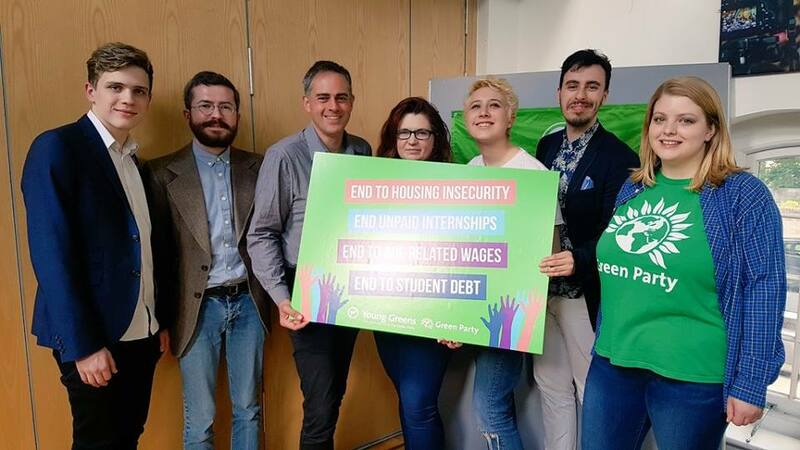 Hannah features in the centre, with Co-Chair of the Green Party of England and Wales Jonathan Bartley to her left, and fellow young greens following the launch of their youth manifesto. I am standing in my hometown of Harlow, Essex and this is the first time I’ve stood as a general election candidate. I have stood in the local elections before, both in Harlow and in Liverpool, where I went to University. This is the second election where we have had a Green candidate for Harlow, and I am the only woman standing out of all parties this time round. In the last election in 2015, nearly 1000 people voted Green in Harlow – it’s not a lot, but it did place us fourth and I want to build on that. As a bellwether constituency, I thought the people of Harlow deserve another option; one that will stand up for people and planet. We ran an open selection process for all members of Harlow Green Party and I was the only candidate who came forward. I’ve completed a few hustings so far and the response has been positive; people have generally said nice things after and while I have felt patronised at times by other candidates, I haven’t had anything negative from the most important people – the voters. What advantages or disadvantages do you think there are being a young person in this election? I think I am more able to connect with some people, because I don’t seem so male, pale and stale and generally I haven’t found any disadvantages. Anyone who tries to dismiss my age should ultimately realise that I’ve been involved in politics for 10 years: first as a youth councillor and then leading to where I am now as Co-Chair of the Young Greens. My age doesn’t really equate to how ready I am to be an MP! I think we have unstable housing, low wages (in comparison to those older) and we leave education with too much debt. In England and Wales, the Green Party would scrap tuition fees, introduce a living rent to provide more stable housing and scrap age-related wage bands. I’m not expecting to be Harlow’s next MP but I am passionate about providing an alternative for Harlow and I think by standing as a candidate I am enabling voters to have that choice. You can follow Hannah’s progress via her Facebook, Twitter, or the Harlow Green Party website.